In this property in Kitamido, there used to be installed `migawari yatorijizoson` built in 1707.A wholesale dealer named Mr Koikeuemon who lived in this island looked up and loved for this Jizo as his lord. By being loved and cherished made his facial expression even more peaceful and smile with full of compassion. For the people who believed in him were blessed for a long time in life.When this place was burned, this jizo san by itself was safe miraculously.Later on, a lady dreamed this jizo in her dream and was told he wants water. 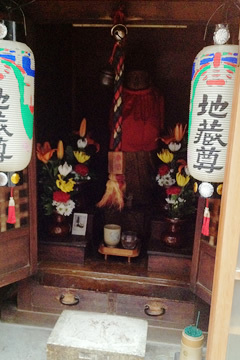 Since she served him water in a long pipe cup.it has never been ran out of water in his cup.Since then ,local people have decided to take care of this jizo and now days it is known as a precious lord,People pray for the well being and health of family .